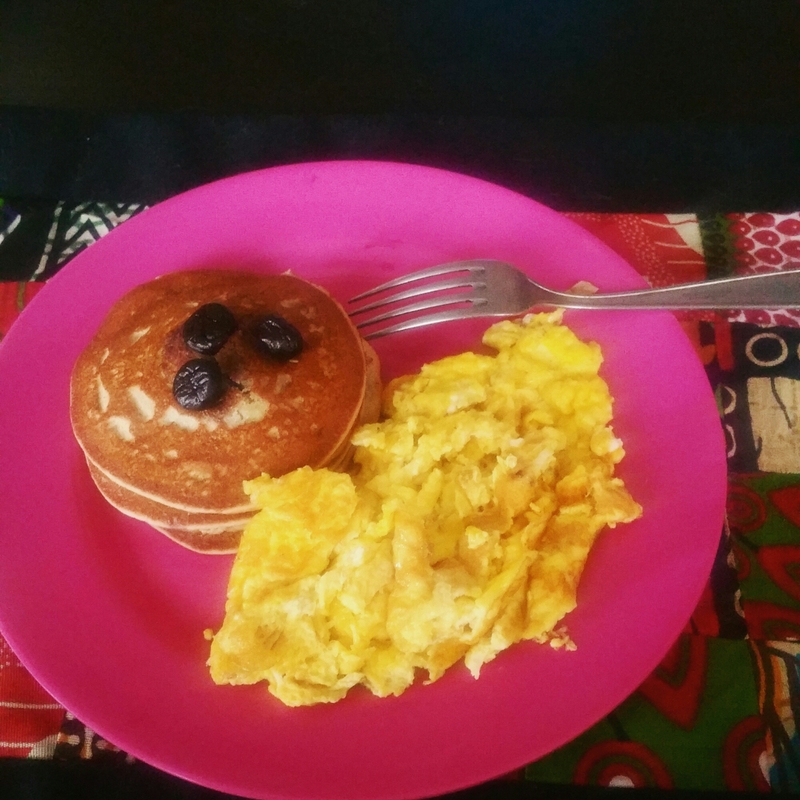 My very late brunch: #glutenfree blueberry pancakes and scrambled eggs with garlic, onion, and cheddar cheese. I’m realizing that I love food and the act of eating. It’s in my best interest to make every meal an act of #selflove and #selfcare. I went to my doctor this week for my yearly checkup and she told me the same thing she told me last year: I need to lose weight. My doctor is a Black female so when she tells me I need to lose weight, I know she is not telling me that because she thinks I need to be a size 2. While I am grateful that I don’t have any serious health concerns, I know that weight loss will help me achieve my optimal health. It’s not like I don’t know how to eat healthy or that I don’t know the importance of exercise. I absolutely do. It’s just that until about 7 years ago, I never had an issue with weight. I was a size 5 and didn’t have to think about what I was eating or how much exercise I did each week. And then, almost overnight, it seemed I couldn’t just eat whatever I wanted or shrug at exercise. Now I had to be intentional about being healthy! I thought my body was turning on me. Why was she being so stubborn about holding on to extra pounds. And then slowly those pounds started creeping up…first 10, then 20…and now, 7 years later, I am a good 60 pounds over what I was back then. And it has been much harder to lose this weight than it was to gain it! I have lost a few pounds since the beginning of the year but I know that, with more intention and commitment, I can lose even more. So I decided to put some accountability around this and make this weight loss journey public. And I am hoping that other Black women who are working to make their bodies healthier, their minds freer, and their spirits lighter will join me on this journey. I am exercising daily. Yes daily, for at least 20 minutes. 1 hour of exercise at least 3 times per week. I am going to join at least one new exercise class. I signed up for the Y yesterday so I have no excuse. I am eating all my foods at serving size. So if 2 crackers is the serving size and I am hungry, I need to eat the 2 crackers or opt for something else. This will generate more discipline. Of course, veggies are at an unlimited serving size. I will have 1 indulgence per week, at serving size. An indulgence means anything that fits into that “no good for you” zone when working to lose weight. If one cookie is the serving size, then that’s all I will eat. This also includes alcohol, so I will probably save my 1 indulgence for my glass of wine while watching Scandal. I will eat very limited carbs, and especially wheat. I haven’t been diagnosed with gluten allergies but I don’t like the way I feel after eating wheat, so I have been using gluten free products lately anyway. I will update my progress at least once a week, including how much weight I have lost, how much exercise I got, how well I kept to my diet, and any other changes. Cheer me on and share your insights! I would love to hear them!